Good morning! The Red Bulls are back in MLS action today @Columbus and are just one win away from taking over the top spot in the Eastern Conference. The Bulls will be looking to extend their MLS unbeaten streak (I believe it's someting like 4 games - 3-0-1) and the Crew will be looking to put that embarrassing mid-week home loss to the lowly Wizards behind them. 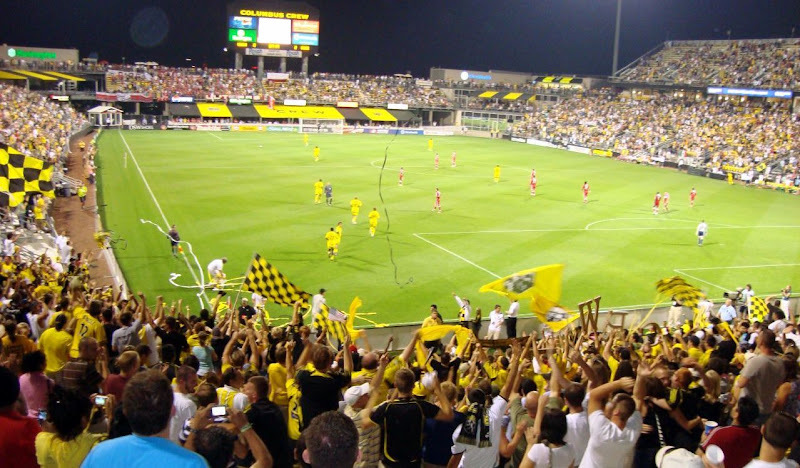 Brand new Red Bulls Designated Player TH14 will be in attendance at Crew Stadium. He won't be on the field, however, as he's not match ready. With all that in mind, let's get to some predictions. This has been a huge week for me. Thierry Henry signing with my beloved Red Bulls, DC United losing on a heartbreaking goal in the waning moments of their game against Seattle, third DP rumors abounding and - last but not least - the very real possibility that my jobless days will be short lived. However wonderful all of this may be, none of it really makes me feel any more confident about our chances this weekend in Columbus, since Henry will not be playing. With the permanently injured Salou missing, we could see Kandji start, or perhaps a Richards/Angel combination with Kandji on the wing. In any case, even though they are probably tired after playing in midweek against Kansas City and will be without Sammy Hagar, I mean Steven Lenhart, the Crew probably have enough weapons to get the job done. So I'll predict a disappointing start to the Henry era, through no fault of his own. Columbus 2 Red Bulls 1. Honestly, Columbus is the better side. They've been picking apart defenses in MLS all season, including ours in our first match this season. In our favor, our defense has rediscovered its early form, with help from Carlos Mendes, and Columbus may not be at its freshest after their Wednesday night match. Our offense has been troubling, though, as we are still struggling to create chances--I am having dreams of Thierry Henry, like Superman, ripping off his street clothes in the 75th minute to reveal the RBNY kit underneath and taking the pitch to knock home the winner. Unfortunately, he won't be doing that and the game will end in a 1-1 draw. The Red Bulls will extend their unbeaten streak to six, and their winless streak to three. After not drawing a match in forever, I am thinking trifecta here. Columbus needs to rebound from a midweek loss to KCW. We need to come back and show something after that drab draw with Baltimore. I think another 1-1 draw will be in order. And for me that will be acceptable. Although a win would be huge. But after Columbus we will let the good times roll with TH and whoever else is coming. Alrighty then! Well have the usual post game commentary in the next day or two, so check back. Viper Out!